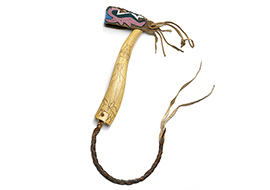 Quirts | A Song for the Horse Nation - October 29, 2011 through January 7, 2013 - The National Museum of the American Indian - Washington, D.C.
A quirt, or short riding whip, was used to urge a horse to greater speed. 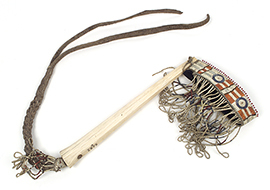 But Native warriors also used them to “count coup.” A warrior would gallop up to an enemy in battle and, instead of killing him, would touch him with his quirt or with a special coup stick. Counting coup was a highly honored form of bravery. American Indians have lived on this continent for tens of thousands of years. Prehistoric drawings and carvings decorate the walls of cliffs and caves across North America and tell us of spiritual journeys, supernatural beings, animals, and the exploits of warriors from long ago. 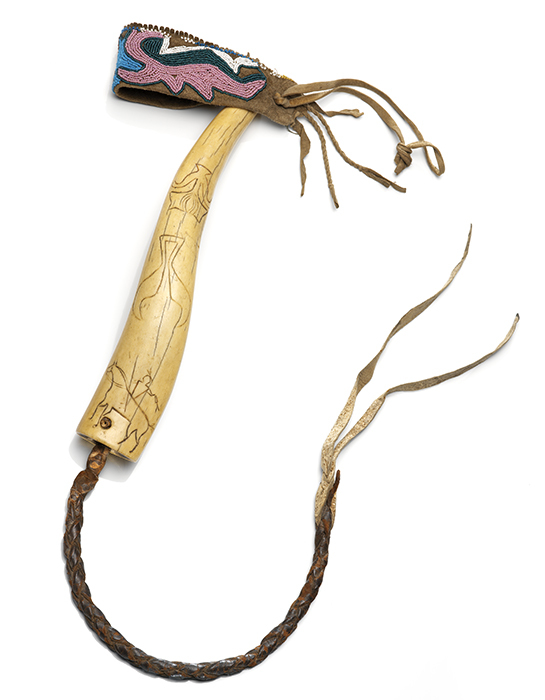 The figures on the handle of this Assiniboine quirt resemble ancient carvings on a stone wall in southern Alberta, Canada.